Q. How many times can the latest version of eneloop batteries be recharged? Q. Can I charge 2100 cycle and former versions of eneloop batteries at the same time? A. Yes. Both the 2100 and former versions of eneloop batteries can be charged together. Q. 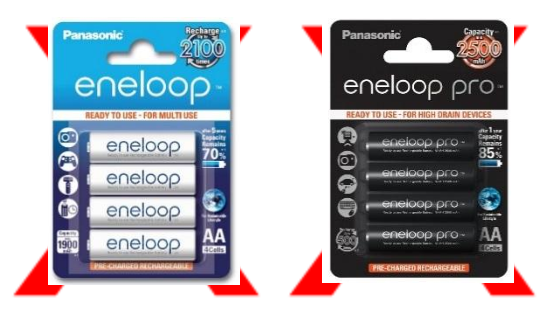 How can I tell the difference between the 2100 cycle cells and the other eneloop batteries? A. 2100 cycle eneloop batteries first began shipping in April of 2014. All regular (white label) eneloop product shipping from our facility in Columbus, GA, is the latest 2100 cycle battery. Q. What is the chemistry of eneloop battery cells? Q. What does the term mAh stand for? A. The (mA) stands for milliamps. The (h) stands for hour. This rating determines the amount of power that can be stored on a rechargeable battery, similar to the size of the gas tank in your car. Q. Why does eneloop packaging have both 2000mAh and 1900mAh listed? A. eneloop batteries deliver up to 2000 mAh typical, 1900 mAh minimum power. Both are listed on the package due to packaging regulations in various countries. AAA batteries are 800mAh typical, and 750mAh minimum. 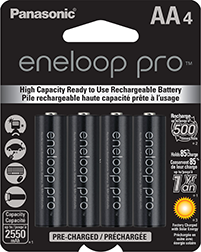 eneloop pro AA cells are 2550mAh typical and 2450mAh minimum and eneloop pro AAA cells are 950mAh typical and 900mAh minimum. Q. eneloop cells now claim they can maintain 70% charge for up to 10 years (when unused and stored properly). How was this accomplished and how can I tell the difference? A. In 2015, eneloop celebrated its 10th Anniversary, having first launched in 2005. After conducting extensive storage life capacity testing, it has been determined that eneloop now will maintain 70% charge up to 10 years (when unused and stored properly). Our new packaging, which began shipping in April 2015, highlights this revised feature. Q. Why are eneloop batteries 1.2V and alkaline batteries 1.5V? A. All Ni-MH rechargeable batteries, regardless of the brand, are 1.2V. The voltage rating has to do with the chemical makeup of the rechargeable batteries. Alkaline batteries are 1.5V based on their chemical composition. However, eneloop batteries maintain their voltage over the life of the charge, unlike alkaline batteries. This means they will maintain performance of the device they are powering until they need to be recharged. Alkaline batteries will lose voltage throughout their life and will provide less and less power, often resulting in hesitation and intermittent power to the device (as the battery loses power during its lifespan). Q. What is the number of charge/discharge cycles I can expect from eneloop batteries? A. The latest version of eneloop batteries can be recharged up to 2100 times**. Older versions of eneloop product may be charged up to 1500 and 1800 times**. eneloop pro batteries can be recharged up to 500 times. ** Recharge cycles based on testing method established by IEC 61951-2(7.5.1.3). Q. I just purchased new eneloop batteries. Do they need to be charged before using? A. No. All eneloop battery cells are pre-charged (at our factory using solar energy) and ready to use right out of the package. eneloop cells are specially formulated to hold 70% of their charge for up to ten years*, when unused and stored properly. eneloop pro batteries maintain 85% of their charge for up to one year*, when unused and stored properly. * Charge capacity and mAh estimates based on Panasonic internal IEC 61951-2(7.3.2) testing. Q. Where can I buy eneloop batteries? A. eneloop batteries are available in retail and online locations nationwide. Costco warehouse locations, Best Buy retail stores, multiple online sources including Amazon.com., several photo retailers including B&H Photo, and an ever-expanding number of other electronics retailers are now stocking eneloop. Q. Will these batteries work in my solar lights? A. You will need to check the specifications of the light to see if it is compatible with Ni-MH batteries. eneloop batteries provide exceptional, long lasting power. Q. Do the eneloop pro batteries come in a package with a charger? A. Yes, there are multiple battery / charger product options available. The K-KJ17KHCA4A features 4AA eneloop batteries and a CC17 charger, the K-KJ17M3A4BA features 4AAA eneloop batteries and a CC17 charger, the K-KJ55MCA4BA features 4AA eneloop batteries and a CC55 charger, the K-KJ55M3A4BA features 4AAA eneloop batteries and a CC55 charger, and the K-KJ17KHCA4A includes 4AA eneloop pro batteries and a CC17 charger in black. Q. How long does it take to charge the eneloop batteries? A. It depends on the Panasonic charger used, and the remaining charge on the eneloop battery. Panasonic is currently selling both the CC17 and CC55 chargers. These units charge each of the battery cells individually. This means you can charge eneloop batteries and eneloop pro with “varying” level of remaining battery power. only been partially discharged. The CC17 4 position eneloop battery charger will charge 4 AA (fully drained) batteries in approximately 7 hours, 4 AAA batteries in approximately 6 hours. The CC55 charger will charge 4AA or 4AAA (fully drained) eneloop batteries in approximately 3 hours, 2 AA or 2AAA (fully drained) eneloop batteries in approximately 1.5 hours. The CC55 charger will also charge 4AA or 4AAA (fully drained) eneloop pro batteries in approximately 4 hours, 2 AA or 2AAA (fully drained) eneloop pro batteries in approximately 2 hours. To assure safety and the best performance, we always recommend using a Panasonic charger for charging Panasonic batteries. Q. With the eneloop chargers can I charge 1 battery cell at a time? A. Yes, the current Panasonic CC17 and CC55 chargers charge eneloop cells individually. Q. Why does the LED light not come on with the 4-position charger that I just purchased? A. The protective strip may still be in place. Remove the batteries from the charger and remove the protective strip that is covering the positive (+) contacts of the charger. Place the batteries back into the charger and plug the charger into an outlet. Q. What does the terminology “memory effect” mean? A. “Memory Effect” is a term used to describe the effects on the overall life of the battery when it goes through charge and discharge cycles. eneloop batteries do not experience “memory effect” and do not need to be fully discharged before being recharged. Q. Can I use other brands of chargers to recharge eneloop batteries? A. We recommend using only Panasonic brand battery chargers. Q. Do eneloop batteries fall under the airline travel guidelines for Lithium batteries? A. No eneloop batteries do not fall under the travel restrictions for Lithium batteries. 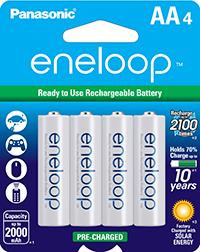 eneloop batteries are Nickel Metal Hydride cells and considered “dry batteries”, not lithium technology. For more information on travelling with lithium batteries, please go to http://safetravel.dot.gov. Q. Why aren’t there any eneloop batteries in the C and D formats available? A. Roughly 85% of all disposable batteries are sold in either AA or AAA size. Alternatively, we offer for C and D size plastic adaptors, which allow consumers to use AA-size eneloop batteries in a C or D size battery devices. Q. Can dropping the battery cause damage to it? Q. Do eneloop cells work in DECT phones? A. eneloop batteries do work very well for use in DECT phones. However, it is always recommended that you check with the manufacturer of your phone to ensure compatibility. We now offer HHR4DPA (4 pack) and HHR2DPA (2 pack) Panasonic DECT phone Ni-Mh batteries designed for use in Panasonic DECT phones. We recommend using either eneloop rechargeable cells or our DECT phone batteries. Q. Will the eneloop battery work with Nintendo Wii remotes? A. Yes, the eneloop battery does work with the Nintendo Wii battery operated remote controls. In fact, they are a great alternative to alkaline batteries in these types of gaming devices. They also work with other types of remotes that require an AA or AAA batteries. Q. Does temperature have an effect on their performance? A. eneloop cells outperform alkaline and some other rechargeable batteries in freezing temperatures and perform well all the way down to -4 degrees Fahrenheit. Temperature does influence all battery performance including eneloop batteries. In extremely high temperatures batteries (including eneloop cells) can discharge at a more rapid rate. Q. Where is the best place to store my eneloop battery cells? Does the storage-temperature matter? Can they be stored in a freezer? A. The best place to store any battery, rechargeable or not, is in a cool, dry place, such as an indoor drawer, cabinet, or closet. Keep them away from the possibility of coming in contact with extreme heat. It is recommended to store them at or around 75.2 degrees Fahrenheit, or 24 degrees Celsius. It is not recommended to store them in a freezer. 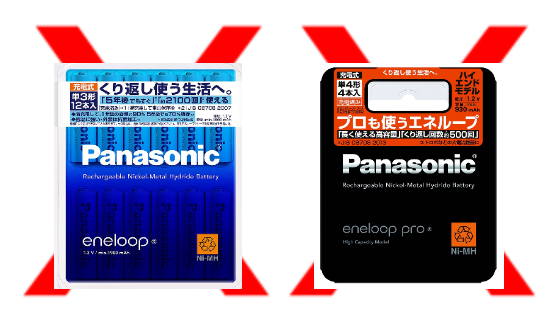 Panasonic offers plastic battery cases in both a 6-pack (model # BQ-CASE6SA, or a 2-pack (model # BQ-CASE6SA). These Panasonic battery cases were designed by our engineering team in Japan, making it easier to safely store up to 4 AA or 5 AAA batteries in each case. Q. What is the difference between “Pre-Charged”, “Ready to Use” “Hybrid”, “Stay-Charged”, “Active Charged”, and “Ready to Go”? A. Those are typically marketing terms for Low-Self-Discharge (LSD) NiMH batteries that have been pre-charged at the factory. LSD batteries will all maintain some level of charge while only eneloop makes specific claims that the batteries will maintain 70% of their charge for up to 10 years (when unused and stored properly). eneloop batteries can be recharged up to 2100 times eneloop batteries and maintain 70% of their charge up to 10 years. eneloop pro cells maintain 85% of their charge for up to one year (when unused and stored properly). On occasion, you may receive products sold online from other counties. We recommend purchasing only product packaged for sale in the US. We do not recommend purchasing gray goods” from Europe or Japan (as shown below) as US warranties may not apply.